Diu District is the tenth least populated district in India. It is located on the western side of India, receiving a high amount of solar light. Diu was recently named as one of the smart cities in India and is setting an example for the entire nation in setting up a clean energy roadmap. The island used to earlier import all its power needs from the adjacent state of Gujarat and spend close to INR 80 lakh per month for the same. Also, people used to only get 59-60 kV voltage, instead of 66 kV, due to transmission and distribution loss. Also, read about the large potential of mini and micro grids in India’s rural markets. 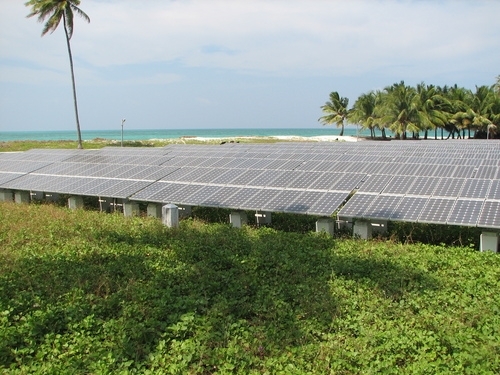 It has now installed a 9 MW solar park that helps in meeting close to 30% of the island’s daily power requirement. The transmission losses have reduced and consumers also pay less power tariff. The plant was built in two phases. Phase I (3 MW) was executed by BHEL and launched in 2016 and Phase II (6 MW) was launched recently in February 2018 was executed by Ujaas Energy. The island is also planning to set up 6.8 MW wind power plant by 2019, which should make Diu completely energy independent. The island is also setting up rooftop solar plants at a rapid pace with 79 government buildings now having a rooftop solar plant on their rooftops, generating 1.27 MW annually. The Diu government is also encouraging local residents to install rooftop solar plants and is also giving a subsidy of INR 10,000-50,000 for installing 1-5 MW of rooftop solar panels. Renewable energy is an ideal solution to power islands which are cut off from the mainland and have to incur huge costs as well as losses to procure power from nearby towns. Other island nation of Andaman & Nicobar does not have grid connections with the nearby land and is thus exploring solar plus storage options.